Ida Metsberg performed at Caffe Vivaldi on November 18th. She is a singer-songwriter from Finland, who came to New York to study musical theater only to discover she didn’t want to do it in the end. Instead, she turned to composition and lyrics. At Caffe Vivaldi, breeding ground for musical talent known and unknown, Metsberg expressed feelings sure to resound with the mostly young audience: love and breakup, homesickness, elation over being young in New York, and confusion over which way one’s life is headed. She accompanied herself on guitar and piano, and although her voice and compositions are pleasing to the ear, it is the eloquence in the lyrics, flowing smoothly with the tunes, which remained as the most memorable impression of the evening. All the more so coming from a non-native English speaker and good enough to stand alone as poetry. One of the many songs Ida performed during the evening was called Time. You can see the lyrics below. To find more information about Ida, visit her Facebook page here. You can also listen to her songs at www.soundcloud.com/ida-metsberg. Johanna Telander performed at Caffe Vivaldi on October 21st together with her husband Christopher on guitar, Tina Lama on base, and Ryan Engelbert on drums. Amanda Yachechak sang background vocals. Johanna is a Finnish-born singer-songwriter who accompanies herself on the piano. She has taken a “mommy-break” after the birth of her daughter in June, and clearly enjoyed being back on stage. Her music with original lyrics touch on the usual themes of love and other emotions but she also has songs about the coming of spring and summer; as she said in an introduction, for Finns these themes are so important she probably has about 60 songs devoted to the theme! Despite the cast being thrown together on short notice, all the players worked in sync to produce a rhythmic, vigorous performance with many catchy, but not too simplistic tunes. A tender, melodious song called Sielunpeili, reflecting on the sleeping child in front of her, was written and performed in Finnish just for this occasion. From left to right: Tina Lama, Christopher Telander, Amanda Yachechak, and Johanna Melander. The unfortunate accidental double-booking shortened the performance, but the place and the intimate ambience is a true trait of Greenwich Village, and for the owner, Ishrat, receiving these players is truly a labor of love. We hope to continue offering Finnish talent in this setting from time to time but it is worth visiting any night of the week and weekend brunchtime to hear other New York musicians. See www.caffevivaldi.com for more info about the venue and www.johannatelander.com to read more about the artist. Concert series continues with Ida Metsberg’s performance at good old Caffe Vivaldi. Ida Metsberg is a Finnish singer-songwriter who moved to New York in 2012 to study musical theatre at The American Musical and Dramatic Academy but after graduation decided to dive into the music scene and focus on her own material. She has played at venues such as the Bitter End and Prohibition, and is currently recording music that’s to be released in 2016. Her music is influenced by the likes of Sara Bareilles and Ingrid Michaelson, and she focuses strongly on writing honest lyrics about her own life and telling her stories with a pop/folk sound. For more updates, you can like her page on Facebook and for some original music you can go to https://soundcloud.com/ida-metsberg. Johanna Melander, also known as Jozu Kristi, is an international traveler and freelance artist. Although she has lived all over and has called the US her home since 2004, she started her music career in Helsinki, Finland. Having collaborated with professionals in Europe and the US, and working with Warner and BMG in Helsinki, Jozu’s career took shape performing in cover bands including jazz trios, disco bands, and big bands. Jozu also recorded solo projects for labels such as Universal Music, scoring a top-selling and most-played list hit single in Finland in 2003. The single was released under the name Ensimmäinen Päivä by Joanna. You might have also caught her performing her own original songs in one of the many live music venues of NYC’s indie scene. Always looking for new opportunities to utilize her creative abilities, Jozu remains grateful for all those who have continuously believed in her. Jean Sibelius, Finland’s perhaps greatest contribution to the world’s musical heritage, was born 150 years ago. In honor of this, concerts are taking place all over Finland and the world. While he is perhaps best known for his symphonies and his violin concerto, and, of course, for Finlandia hymn – the symphonic poem which is practically Finland’s second national anthem – he also composed many songs to texts by contemporary poets. Many of them were in Swedish, his mother tongue (one of Finland’s two official languages). Olga Heikkilä is a Finnish lyric soprano with already an impressive international career. Educated in Finland and Denmark, she made her US debut with a series of Sibelius’ songs, accompanied by Kalle Toivio on piano in the lovely hall upstairs at Estonian House in New York City. The program choices offered a chance to hear not only well-known songs such as “Flickan kom ifrån sin älsklings mote” and “Var det en dröm”, but also several lesser-known ones. Although Ms. Heikkilä was visibly pregnant, her voice was both strong and sensitive, and the collaboration with Mr. Toivio, who has been heard many times in this, his present hometown, was seamless. The evening ended with Mr. Toivio’s signature bravura performance of Finlandia with Ms. Heikkilä singing. The audience appreciated the concert being offered for free, thanks to pro bono appearances by the artists, and support from Finlandia Foundation New York Metropolitan Chapter, Finlandia Foundation national, Suomi-seura, and Musiikin Edistämissäätiö (Finland). Our team and our co-organizations want to thank everyone involved in the FCF’s Annual Midsummer 5K Run as everyone’s help and support was crucial to the success of this event. The team spirit among the runners and volunteers was amazing. It was great to see the runners cheering each other on – the way it is supposed to be in an event like this! Our runners got amazing times. This year fastest man was Jyrki Ruohomäki, whose time was 17:22 and fastest woman was Johanna Kreuz and her time was 22:10. Congratulations! Thanks to our amazing sponsors, we were able to reward our runners with great goodie bags, sandwiches, and prizes. Thank you all so much for coming out and supporting women’s empowerment. Hopefully this will be a great Father’s Day tradition at FCF! What a great start to FCF’s new concert series! We want to begin by thanking the Olli Hirvonen trio who played gracefully together and Caffe Vivaldi for hosting the concert. It was truly a great night! FCF will have a concert every month highlighting Finnish musicians and their talent to be held at Caffe Vivaldi. Stay tuned for more information on the series! Finland Center Foundation had its Annual Meeting on Wednesday, March 18 in Salmagundi Club. Afterwards we were able to enjoy a concert by violinist Leena Jaakkola and pianist Markus Kaitila in honor of the great Finnish composer Jean Sibelius as 2015 marks the 150th anniversary of his birth. In addition to Sibelius, Jaakkola and Kaitila played pieces composed by Chopin and Grieg. 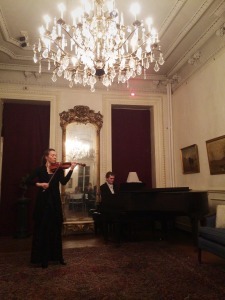 The beautiful parlour was the perfect setting for the delightful concert. Huge thanks go to Leena Jaakkola and Markus Kaitila!